Using Boolean search operators, search conditions, and other search query techniques to refine your search results. Searching for sensitive data types and custom sensitive data types in SharePoint and OneDrive for Business. For step-by-step instructions on how to create a Content Search, see Content Search in Office 365. Content Search in the Security & Compliance Center and the corresponding *-ComplianceSearch cmdlets in Security & Compliance Center PowerShell use the Keyword Query Language (KQL). For more detailed information, see Keyword Query Language syntax reference. The following table lists email message properties that can be searched by using the Content Search feature in the Security & Compliance Center or by using the New-ComplianceSearch or the Set-ComplianceSearch cmdlet. The table includes an example of the property:value syntax for each property and a description of the search results returned by the examples. You can type these property:value pairs in the keywords box for a Content Search. attachmentnames:annual* Messages that have an attached file named annualreport.ppt. In the second example, using the wildcard returns messages with the word "annual" in the file name of an attachment. bcc:"Pilar Pinilla" All examples return messages with Pilar Pinilla included in the Bcc field. yellow category:"Red Category" Messages that have been assigned the red category in the source mailboxes. cc:"Pilar Pinilla" In both examples, messages with Pilar Pinilla specified in the CC field. Folderid The folder ID (GUID) of a specific mailbox folder. If you use this property, be sure to search the mailbox that the specified folder is located in. Note that only the specified folder will be searched. Any subfolders in the folder won't be searched. To search sub-folders, you need to use the Folderid property for the sub-folder you want to search. folderid:2370FB455F82FC44BE31397F47B632A70000000001160000 AND participants:garthf@contoso.com The first example returns all items in the specified mailbox folder. The second example return all items in the specified mailbox folder that were sent or received by garthf@contoso.com. HasAttachment Indicates whether or not a message has an attachment. Use the values true or false. from:pilar@contoso.com AND hasattachment:true Messages sent by the specified user that have attachments. isread:false The first example returns messages with the IsRead property set to True. The second example returns messages with the IsRead property set to False. itemclass:ipm.externaldata.Twitter* AND from:"Ann Beebe" AND "Northwind Traders" The first example returns Facebook items that contain the word "contoso" in the Subject property. The second example returns Twitter items that were posted by Ann Beebe and that contain the keyword phrase "Northwind Traders". For a complete list of values to use for third-party data types for the ItemClass property, see Use Content Search to search third-party data that was imported to Office 365.
kind:externaldata The first example returns email messages that meet the search criteria. The second example returns email messages, instant messaging conversations (including Skype for Business conversations and chats in Microsoft Teams), and voice messages that meet the search criteria. The third example returns items that were imported to mailboxes in Office 365 from third-party data sources, such as Twitter, Facebook, and Cisco Jabber, that meet the search criteria. For more information, see Archiving third-party data in Office 365.
participants:contoso.com Messages sent by or sent to garthf@contoso.com. The second example returns all messages sent by or sent to a user in the contoso.com domain. received>=01/01/2016 AND received<=03/31/2016 Messages that were received on April 15, 2016. The second example returns all messages received between January 1, 2016 and March 31, 2016.
recipients:contoso.com Messages sent to garthf@contoso.com. The second example returns messages sent to any recipient in the contoso.com domain. sent>=06/01/2016 AND sent<=07/01/2016 Messages that were sent on the specified date or sent within the specified date range. size:1..1048567 Messages larger than 25??MB. The second example returns messages from 1 through 1,048,567 bytes (1 MB) in size. Subject The text in the subject line of an email message. Note: When you use the Subject property in a query, ?? ?the search returns all messages in which the subject line contains the text you're searching for. In other words, the query doesn't return only those messages that have an exact match. For example, if you search for subject:"Quarterly Financials", your results will include messages with the subject "Quarterly Financials 2018". subject:"Quarterly Financials"
subject:northwind Messages that contain the phrase "Quarterly Financials" anywhere in the text of the subject line. The second example returns all messages that contain the word northwind in the subject line. to:"Ann Beebe" All examples return messages where Ann Beebe is specified in the To: line. 1 For the value of a recipient property, you can use email address (also called user principal name or UPN), display name, or alias to specify a user. For example, you can use annb@contoso.com, annb, or "Ann Beebe" to specify the user Ann Beebe. When searching any of the recipient properties (From, To, Cc, Bcc, Participants, and Recipients), Office 365 attempts to expand the identity of each user by looking them up in Azure Active Directory. If the user is found in Azure Active Directory, the query is expanded to include the user's email address (or UPN), alias, display name, and LegacyExchangeDN. For example, a query such as participants:ronnie@contoso.com expands to participants:ronnie@contoso.com OR participants:ronnie OR participants:"Ronald Nelson" OR participants:"<LegacyExchangeDN>". The following table lists some of the SharePoint and OneDrive for Business properties that can be searched by using the Content Search feature in the Security & Compliance Center or by using the New-ComplianceSearch or the Set-ComplianceSearch cmdlet. The table includes an example of the property:value syntax for each property and a description of the search results returned by the examples. For a complete list of SharePoint properties that can be searched, see Overview of crawled and managed properties in SharePoint. Properties marked with a Yes in the Queryable column can be searched. Author The author field from Office documents, which persists if a document is copied. For example, if a user creates a document and the emails it to someone else who then uploads it to SharePoint, the document will still retain the original author. Be sure to use the user's display name for this property. author:"Garth Fort" All documents that are authored by Garth Fort. ContentType The SharePoint content type of an item, such as Item, Document, or Video. contenttype:document All documents would be returned. Created The date that an item is created. created\>=06/01/2016 All items created on or after June 1, 2016. CreatedBy The person that created or uploaded an item. Be sure to use the user's display name for this property. createdby:"Garth Fort" All items created or uploaded by Garth Fort. DetectedLanguage The language of an item. detectedlanguage:english All items in English. DocumentLink The path (URL) of a specific folder on a SharePoint or OneDrive for Business site. If you use this property, be sure to search the site that the specified folder is located in. To return items located in subfolders of the folder that you specify for the documentlink property, you have to add /* to the URL of the specified folder; for example, documentlink: "https://contoso.sharepoint.com/Shared Documents/*"
For more information about searching for the documentlink property and using a script to obtain the documentlink URLs for folders on a specific site, see Use Content Search in Office 365 for targeted collections. documentlink:"https://contoso-my.sharepoint.com/personal/garthf_contoso_com/Documents/Private"
documentlink:"https://contoso-my.sharepoint.com/personal/garthf_contoso_com/Documents/Shared with Everyone/*" AND filename:confidential The first example returns all items in the specified OneDrive for Business folder. The second example returns documents in the specified site folder (and all subfolders) that contain the word "confidential" in the file name. FileName The name of a file. filename:"marketing plan"
filename:estimate The first example returns files with the exact phrase "marketing plan" in the title. The second example returns files with the word "estimate" in the file name. lastmodifiedtime>=05/10/2016 AND lastmodifiedtime<=06/1/2016 The first example returns items that were changed on or after May 1, 2016. The second example returns items changed between May 1, 2016 and June 1, 2016. ModifiedBy The person who last changed an item. Be sure to use the user's display name for this property. modifiedby:"Garth Fort" All items that were last changed by Garth Fort. Path The path (URL) of a specific site in a SharePoint or OneDrive for Business site. To return items located in folders in the site that you specify for the path property, you have to add /* to the URL of the specified site; for example, path: "https://contoso.sharepoint.com/Shared Documents/*"
Note: Using the Path property to search OneDrive locations won't return media files, such as .png, .tiff, or .wav files, in the search results. Use a different site property in your search query to search for media files in OneDrive folders. path:"https://contoso-my.sharepoint.com/personal/garthf_contoso_com/*" AND filename:confidential The first example returns all items in the specified OneDrive for Business site. The second example returns documents in the specified site (and folders in the site) that contain the word "confidential" in the file name. sharedwithusersowsuser:"garthf@contoso.com" Both examples return all internal documents that have been explicitly shared with Garth Fort and that appear on the Shared with me page in Garth Fort's OneDrive for Business account. Site The URL of a site or group of sites in your organization. site:"https://contoso-my.sharepoint.com"
site:"https://contoso.sharepoint.com/sites/teams" The first example returns items from the OneDrive for Business sites for all users in the organization. The second example returns items from all team sites. size:1..10000 The first example returns items larger than 1 byte. The second example returns items from 1 through 10,000 bytes in size. Title The title of the document. The Title property is metadata that's specified in Microsoft Office documents. It's different from the file name of the document. title:"communication plan" Any document that contains the phrase "communication plan" in the Title metadata property of an Office document. The following table lists the contact properties that are indexed and that you can search for using Content Search. These are the properties that are available for users to configure for the contacts (also called personal contacts) that are located in the personal address book of a user's mailbox. To search for contacts, you can select the mailboxes to search and then use one or more contact properties in the keyword query. To search for values that contain spaces or special characters, use double quotation marks (" ") to contain the phrase; for example, businessaddress:"123 Main Street". BusinessAddress The address in the Business Address property. The property is also called the Work address on the contact properties page. BusinessPhone The phone number in any of the Business Phone number properties. CompanyName The name in the Company property. Department The name in the Department property. DisplayName The display name of the contact. This is the name in the Full Name property of the contact. EmailAddress The address for any email address property for the contact. Note that users can add multiple email addresses for a contact. Using this property would return contacts that match any of the contact's email addresses. FileAs The File as property. This property is used to specify how the contact is listed in the user's contact list. For example, a contact could be listed as FirstName,LastName or LastName,FirstName . GivenName The name in the First Name property. HomeAddress The address in any of the Home address properties. HomePhone The phone number in any of the Home phone number properties. IMAddress The IM address property, which is typically an email address used for instant messaging. MiddleName The name in the Middle name property. MobilePhone The phone number in the Mobile phone number property. Nickname The name in the Nickname property. OfficeLocation The value in Office or Office location property. OtherAddress The value for the Other address property. Surname The name in the Last name property. Title The title in the Job title property. You can use the Content Search feature in the security and compliance center to search for sensitive data, such as credit card numbers or social security numbers, that is stored in documents on SharePoint and OneDrive for Business sites. You can do this by using the SensitiveType property and the name of a sensitive information type in a keyword query. For example, the query SensitiveType:"Credit Card Number" returns documents that contain a credit card number. The query SensitiveType:"U.S. Social Security Number (SSN)" returns documents that contains a U.S. social security number. To see a list of the sensitive data types that you can search for, go to Classifications > Sensitive information types in the Security & Compliance Center. Or you can use the Get-DlpSensitiveInformationType cmdlet in the Security & Compliance Center PowerShell to display a list of sensitive information types. You can also use the SensitiveType property to search for the name of a custom sensitive information type that you (or another administrator) created for your organization. Note that you can use the Publisher column on the Sensitive information types page in the Security & Compliance Center (or the Publisher property in PowerShell) to differentiate between built-in and custom sensitive information types. For more information, see Create a custom sensitive information type. For more information about creating queries using the SensitiveType property, see Form a query to find sensitive data stored on sites. You can't use Sensitive data types and the SensitiveType search property to search for sensitive data at-rest in Exchange Online mailboxes. However, you can use data loss prevention (DLP) policies to protect sensitive emaill data in transit. For more information, see Overview of data loss prevention policies and Search for and find personal data. Boolean search operators, such as AND, OR, and NOT, help you define more-precise searches by including or excluding specific words in the search query. Other techniques, such as using property operators (such as >= or ..), quotation marks, parentheses, and wildcards, help you refine a search query. The following table lists the operators that you can use to narrow or broaden search results. + keyword1 + keyword2 + keyword3 Returns items that contain either keyword2 or keyword3 and that also contain keyword1. Therefore, this example is equivalent to the query (keyword2 OR keyword3) AND keyword1. Note that the query keyword1 + keyword2 (with a space after the + symbol) isn't the same as using the ** AND ** operator. This query would be equivalent to "keyword1 + keyword2" and return items with the exact phase "keyword1 + keyword2". - keyword1 -keyword2 The same as the NOT operator. So this query returns items that contain keyword1 and would exclude items that contain keyword2. > [!NOTE]> The ONEAR operator isn't supported when searching mailboxes; it only works when searching SharePoint and OneDrive for Business sites. If you're searching mailboxes and sites in the same search and the query includes the ONEAR operator, the search will return mailbox items as if you were using the NEAR operator. In other words, the search returns items in which the specified words are near each other regardless of the order in which the words occur. : property:value The colon (:) in the property:value syntax specifies that the value of the property being searched for contains the specified value. For example, recipients:garthf@contoso.com returns any message sent to garthf@contoso.com. = property=value The same as the : operator. subject:"Quarterly Financials" Use double quotation marks (" ") to search for an exact phrase or term in keyword and property:value search queries. subject:set* Prefix wildcard searches (where the asterisk is placed at the end of a word) match for zero or more characters in keywords or property:value queries. For example, title:set* returns documents that contain the word set, setup, and setting (and other words that start with "set") in the document title. Note: You can use only prefix wildcard searches; for example, cat* or set*. Suffix searches ( *cat ), infix searches ( c*t ), and substring searches ( *cat* ) are not supported. (quarterly financials) Parentheses group together Boolean phrases, property:value items, and keywords. For example, (quarterly financials) returns items that contain the words quarterly and financials. 1 Use this operator for properties that have date or numeric values. 2 Boolean search operators must be uppercase; for example, AND. If you use a lowercase operator, such as and, it will be treated as a keyword in the search query. You can add conditions to a search query to narrow a search and return a more refined set of results. Each condition adds a clause to the KQL search query that is created and run when you start the search. Create a condition using common properties when searching mailboxes and sites in the same search. The following table lists the available properties to use when adding a condition. Date For email, the date a message was received by a recipient or sent by the sender. For documents, the date a document was last modified. Sender/Author For email, the person who sent a message. For documents, the person cited in the author field from Office documents. You can type more than one name, separated by commas. Two or more values are logically connected by the OR operator. Size (in bytes) For both email and documents, the size of the item (in bytes). Subject/Title For email, the text in the subject line of a message. For documents, the title of the document. As previously explained, the Title property is metadata specified in Microsoft Office documents. You can type the name of more than one subject/title, separated by commas. Two or more values are logically connected by the OR operator. Compliance tag For both email and documents, labels that have been assigned to messages and documents automatically by label policies or labels that have been manually assigned by users. Labels are used to classify email and documents for data governance and enforce retention rules based on the classification defined by the label. You can type part of the label name and use a wildcard or type the complete label name. For more information, see Overview of labels in Office 365. Create a condition using mail properties when searching mailboxes or public folders. The following table lists the email properties that you can use for a condition. Note that these properties are a subset of the email properties that were previously described; these descriptions are repeated for your convenience. Participants All the people fields in an email message; these fields are From, To, CC, and BCC. Type The message class property for an email item. This is the same property as the ItemClass email property. It's also a multi-value condition. So to select multiple message classes, hold the CTRL key and then click two or more message classes in the drop-down list that you want to add to the condition. Each message class that you select in the list will be logically connected by the OR operator in the corresponding search query. For a list of the message classes (and their corresponding message class ID) that are used by Exchange and that you can select in the Message class list, see Item Types and Message Classes. Received The date that an email message was received by a recipient. This is the same property as the Received email property. Recipients The person an email message was sent to. This is the same property as the To email property. Sender The sender of an email message. Sent The date that an email message was sent by the sender. This is the same property as the Sent email property. To The recipient of an email message. Create a condition using document properties when searching for documents on SharePoint and OneDrive for Business sites. The following table lists the document properties that you can use for a condition. Note that these properties are a subset of the site properties that were previously described; these descriptions are repeated for your convenience. Author The author field from Office documents, which persists if a document is copied. For example, if a user creates a document and the emails it to someone else who then uploads it to SharePoint, the document will still retain the original author. Title The title of the document. The Title property is metadata that's specified in Office documents. It's different than the file name of the document. Created The date that a document is created. Last modified The date that a document was last changed. File type The extension of a file; for example, docx, one, pptx, or xlsx. This is the same property as the FileExtension site property. When you add a condition, you can select an operator that is relevant to type of property for the condition. The following table describes the operators that are used with conditions and lists the equivalent that is used in the search query. After property>date Used with date conditions. Returns items that were sent, received, or modified after the specified date. Before property<date Used with date conditions. Returns items that were sent, received, or modified before the specified date. Between date..date Use with date and size conditions. When used with a date condition, returns items there were sent, received, or modified within the specified date range. When used with a size condition, returns items whose size is within the specified range. Contains any of (property:value) OR (property:value) Used with conditions for properties that specify a string value. Returns items that contain any part of one or more specified string values. NOT property:value Used with conditions for properties that specify a string value. Returns items that don't contain any part of the specified string value. NOT property=value Used with conditions for properties that specify a string value. Returns items that don't contain the specific string. Equals any of (property=value) OR (property=value) Used with conditions for properties that specify a string value. Returns items that are an exact match of one or more specified string values. 1 This operator is available only for conditions that use the Size property. Keep the following in mind when using search conditions. A condition is logically connected to the keyword query (specified in the keyword box) by the AND operator. That means that items have to satisfy both the keyword query and the condition to be included in the results. This is how conditions help to narrow your results. If you add two or more unique conditions to a search query (conditions that specify different properties), those conditions are logically connected by the AND operator. That means only items that satisfy all the conditions (in addition to any keyword query) are returned. If you add more than one condition for the same property, those conditions are logically connected by the OR operator. That means items that satisfy the keyword query and any one of the conditions are returned. So, groups of the same conditions are connected to each other by the OR operator and then sets of unique conditions are connected by the AND operator. If you add multiple values (separated by commas or semi-colons) to a single condition, those values are connected by the OR operator. That means items are returned if they contain any of the specified values for the property in the condition. The search query that is created by using the keywords box and conditions is displayed on the Search page, in the details pane for the selected search. In a query, everything to the right of the notation (c:c) indicates conditions that are added to the query. Conditions only add properties to the search query; the don't add operators. This is why the query displayed in the detail pane doesn't show operators to the right of the (c:c) notation. KQL adds the logical operators (according to the previously explained rules) when the executing the query. You can use the drag and drop control to re-sequence the order of conditions. Just click on the control for a condition and move it up or down. If a condition accepts multiple values, we recommend that you use a single condition and specify multiple values (separated by commas or semi-colons). This helps ensure the query logic that's applied is what you intend. The following examples show the GUI-based version of a search query with conditions, the search query syntax that is displayed in the details pane of the selected search (which is also returned by the Get-ComplianceSearch cmdlet), and the logic of the corresponding KQL query. This example returns documents on SharePoint and OneDrive for Business sites that contain a credit card number and were last modified before January 1, 2016. This example returns email items or documents that contain the keyword "report", that were sent or created before April 1, 2105, and that contain the word "northwind" in the subject field of email messages or in the title property of documents. The query excludes Web pages that meet the other search criteria. This example returns email messages or calendar meetings that were sent between 12/1/2016 and 11/30/2016 and that contain words that start with "phone" or "smartphone". A sharing invitation that requires users to sign in to your organization as an authenticated user. An anonymous guest link, which allows anyone with this link to access the resource without having to be authenticated. The query ViewableByExternalUsers:true AND SensitiveType:"Credit Card Number" will return all items that have been shared with people outside your organization and contain a credit card number. The query ViewableByExternalUsers:true AND ContentType:document AND site:"https://contoso.sharepoint.com/Sites/Teams" will return a list of documents on all team sites in the organization that have been shared with external users. A search query such as ViewableByExternalUsers:true AND ContentType:document might return a lot of .aspx files in the search results. To eliminate these (or other types of files), you can use the FileExtension property to exclude specific file types; for example ViewableByExternalUsers:true AND ContentType:document NOT FileExtension:aspx. A user shares a file or folder with a person outside your organization. A user creates and sends a link to a shared file to a person outside your organization. This link allows the external user to view (or edit) the file. A user sends a sharing invitation or a guest link to a person outside your organization to view (or edit) a shared file. While the ViewableByExternalUsers property represents the status of whether a document or site is shared with external users, there are some caveats to what this property does and doesn't reflect. In the following scenarios, the value of the ViewableByExternalUsers property won't be updated, and the results of a Content Search query that uses this property may be inaccurate. Changes to sharing policy, such as turning off external sharing for a site or for the organization. The property will still show previously shared documents as being externally accessible even though external access might have been revoked. Changes to group membership, such as adding or removing external users to Office 365 Groups or Office 365 security groups. The property won't automatically be updated for items the group has access to. Sending sharing invitations to external users where the recipient hasn't accepted the invitation, and therefore doesn't yet have access to the content. In these scenarios, the ViewableByExternalUsers property won't reflect the current sharing status until the site or document library is re-crawled and re-indexed. As previously explained, you can use the SharedWithUsersOWSUser property so search for documents that have been shared between people in your organization. 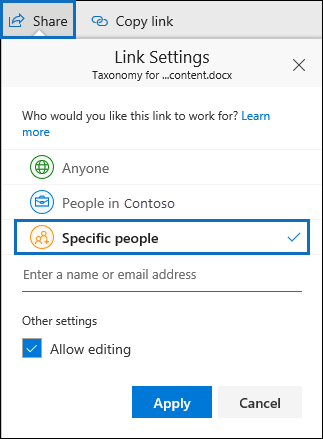 When a person shares a file (or folder) with another user inside your organization, a link to the shared file appears on the Shared with me page in the OneDrive for Business account of the person who the file was shared with. For example, to search for the documents that have been shared with Sara Davis, you can use the query SharedWithUsersOWSUser:"sarad@contoso.com". If you export the results of this search, the original documents (located in the content location of the person who shared the documents with Sara) will be downloaded. Note that documents must be explicitly shared with a specific user to be returned in search results when using the SharedWithUsersOWSUser property. For example, when a person shares a document in their OneDrive account, they have the option to share it with anyone (inside or outside the organization), share it only with people inside the organization, or share it with a specific person. Here's a screenshot of the Share window in OneDrive, that shows the three sharing options. Only documents that are shared by using the third option (shared with Specific people) will be returned by a search query that uses the SharedWithUsersOWSUser property. The previous keyword query excludes chats in Microsoft Teams because Skype for Business conversations are saved as email messages with a Subject line that starts with the word "Conversation". The Boolean operators AND, OR, NOT, NEAR, and ONEAR must be uppercase. A space between two keywords or two property:value expressions is the same as using AND. For example, from:"Sara Davis" subject:reorganization returns all messages sent by Sara Davis that contain the word reorganization in the subject line. Use syntax that matches the property:value format. Values are not case-sensitive, and they can't have a space after the operator. If there is a space, your intended value will just be a full-text search. For example to: pilarp searches for "pilarp" as a keyword, rather than for messages that were sent to pilarp. When searching a recipient property, such as To, From, Cc, or Recipients, you can use an SMTP address, alias, or display name to denote a recipient. For example, you can use pilarp@contoso.com, pilarp, or "Pilar Pinilla". You can use only prefix wildcard searches; for example, cat* or set*. Suffix searches ( *cat ), infix searches ( c*t ), and substring searches ( *cat* ) are not supported. When searching a property, use double quotation marks (" ") if the search value consists of multiple words. For example subject:budget Q1 returns messages that contain budget in the in the subject line and that contain Q1 anywhere in the message or in any of the message properties. Using subject:"budget Q1" returns all messages that contain budget Q1 anywhere in the subject line. To exclude content marked with a certain property value from your search results, place a minus sign (-) before the name of the property. For example, -from:"Sara Davis" will exclude any messages sent by Sara Davis. Some special characters are not included in the search index and therefore are not searchable, these include the operators for search (+ - = :) and the following characters that are either replaced by a $null or can cause errors if searched for ! @ # % ^ & ; _ / ? You can export items based on message type. For example, to export Skype conversations and chats in Microsoft Teams, use the syntax kind:im. To return only email messages, you would use kind:email. To return chats, meetings, and calls in Microsoft Teams, use kind:microsoftteams.